Hertfordshire residents understand the importance of green space. It is home to the world’s first ever garden city, Letchworth, which set the precedent for town planning with an emphasis on countryside preservation and resulted in Welwyn Garden City. Time spent outside is increased thanks to the large number of country parks and high percentage of of green belt land. Roché supply and install awnings across Hertfordshire, helping people continue to enjoy the outdoors lifestyle even when they are at home. 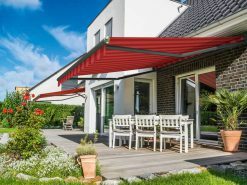 Patio awnings and verandas set the tone for family get-togethers and parties with friends, adding shelter from the sun and rain showers. 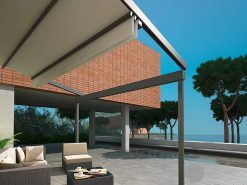 All awnings are designed and manufactured by Markilux and Weinor; the world’s leading names in awning technology. Roché work with these German partners to tailor each product to your home and lifestyle. Book a free survey and we will be able to provide a tailored quotation. Roché supply and install a wide range of Markilux and Weinor patio awnings across Hertfordshire. These products are like no others in the marketplace. They benefit from advanced water resistant and UV-rated fabrics in countless colours and patterns. Motorised and manual operation methods are available, and sizes are customised to fit your patio area. 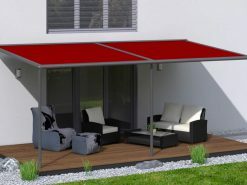 To learn more about our Hertfordshire patio awnings, get in touch. 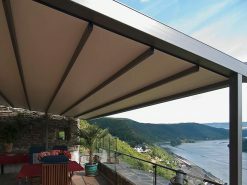 Markilux and Weinor veranda awnings are suitable for covering large and exposed patios. They have front support posts and guides which hold the fabric securely in windy conditions. In all other ways, they are comparable to our patio awnings. 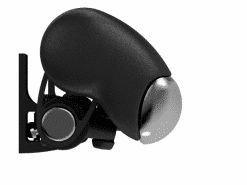 They provide protection from both sun and rain, and come with a choice of manual or electric operation. 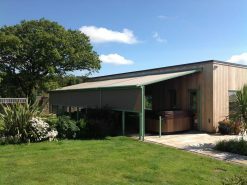 Speak to one of our Hertfordshire awning surveyors to find out how a fabric veranda will work in your garden. 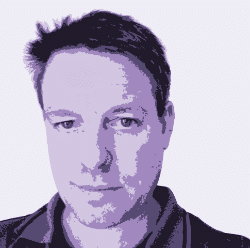 Paul is our main surveyor for Hertfordshire. 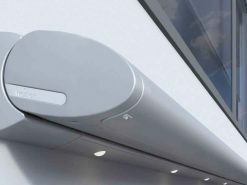 He visits both domestic and commercial properties and will assess your requirements, measure up and answer any questions you have regarding our awnings. He works across the county, assessing the requirements of properties in Watford, Hemel Hempstead, Stevenage, St Albans, Welwyn Garden City, Cheshunt, Hoddesdon, Bishop’s Stortford and Hatfield. 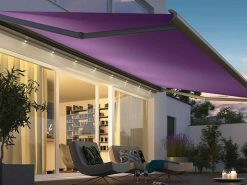 If you are interested in finding out more about our Hertfordshire awning survey process, speak to the Roché team. They will arrange a date and time for Paul to visit when it is convenient with you.